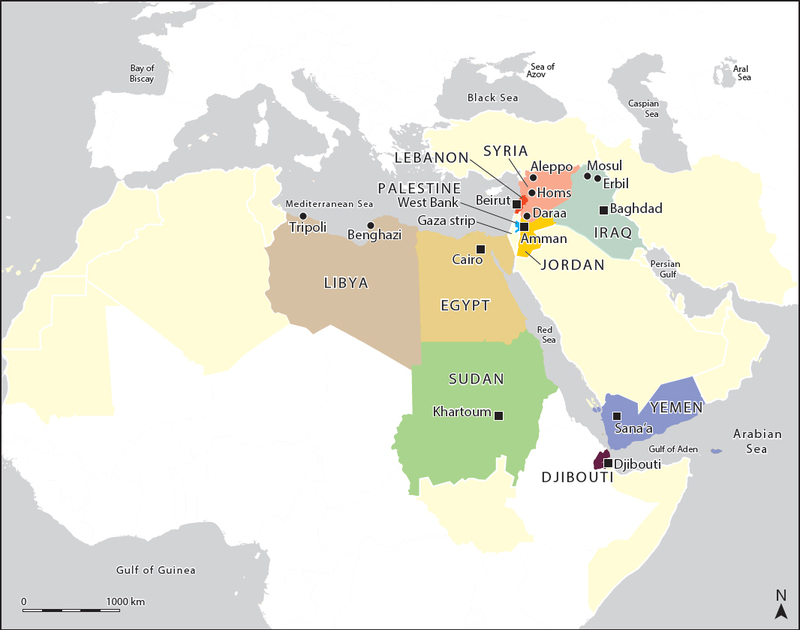 Water has always been a major problem in the MENA region. Despite high production levels, unsustainable management practices and inequality of access have persisted. UNICEF has estimated that at least 52 million people in MENA were deprived of access to an improved water source before 2010. Conflicts have badly worsened the picture, causing violent damage and further complex crises. Aleppo, Mosul and Sana'a are some of the region's emblematic cities that suffered heavy bombing, and where populations remained without access to water for days. Wars also meant that millions of people fled conflict zones and sought refuge elsewhere. The conflict in Syria alone has made over 11 million people leave their homes. Hosting governments have consequently faced sudden increases in demand. A joint research programme by IIED, UNICEF MENA and Water & Sanitation for the Urban Poor (WSUP) has investigated how those involved in water provision in MENA were able to respond to the challenges created by conflict. The study found that the protracted nature of crises has deeply affected mechanisms of water distribution. This means that support has been required to help water providers maintain strengths to continue service provision. The research focused on local utilities' resilience. It also explored the role of international and local organisations, and of independent providers whose role has been crucial to sustain water distribution. International organisations have provided immediate responses: trucking in emergency water supplies, providing equipment and repairing tanks damaged by bombs. But as conflicts have persisted, problems have continued to accumulate. The reactive type of interventions have proved to be insufficient. International organisations have therefore sought new solutions that would minimise the accumulation of impacts affecting utilities. To stop ripple effects, they started adopting more structural approaches. The International Committee of the Red Cross (ICRC) has developed programmes that improve preparedness to conflicts (PDF) and also initiatives that address underlying capacity issues. In Iraq, for instance, it has trained local technicians for emergency interventions, and worked with utility staff to address internal management gaps. Capacity-building support has included developing water infrastructure that uses less energy – a necessary input in water distribution, but also a considerably disputed resource in times of war. Yemen, among other MENA countries, is particularly affected by fuel embargoes. International programmes are more effective where trusted relationships have developed with local utilities over time, and not just as they step in at the onset of a crisis. The Bekaa Water Establishment of Lebanon reports: "A significant amount of international interventions' budget and time is spent on administrative and logistic set up, whereas very little is then left to actually address problems on the ground". Local governments and utilities say they prefer working hand-in-hand with those who are already implemented, understand local challenges, and are ready to provide long-term and continued support. Private water providers – whether formal and informal – have considerably increased their activities since 2011. Often operating in the shadows, they have become the primary water providers in some cities. Too little is understood about their provision mechanisms. They have helped entire populations to survive, as neither governments nor international organisations could adequately meet people’s needs. Mercy Corps reports that 68 per cent of drinking water in Gaza comes from private water trucking companies. However, these operations are often occurring outside monitoring regulations. This implies risks, including the distribution of contaminated water, or water being sold at very high prices. The research also aims to demystify the notion of water scarcity. What many consider an issue of limited freshwater availability in the natural environment is, in fact, a combination of physical, infrastructural and institutional issues. These have resulted in fragile systems of water provision that are vulnerable to further impacts. Our report argues that there is a crucial need to break patterns of accumulated issues and growing vulnerability. Utilities and supporting actors must move away from unsustainable water production practices. How can service providers improve their resilience? Our case studies from Jordan, Lebanon, Syria, Yemen, Iraq and Palestine show that there is much to be done to achieve resource efficiency, better manage demand, and identify current needs and gaps. Building the resilience of water service providers in MENA requires simultaneous actions so opportunities are maximised on different fronts. Local actors need help to increase their ability to undertake immediate relief operations. But this support must be complemented by consistent assistance that bolsters long-term planning. This will mean that utilities will better be able to respond to future shocks, and be less dependent on external actors to sustain levels of services. The research on water provision during conflicts in MENA was a joint initiative between IIED, through the Urban Crises Learning Fund, WSUP and UNICEF. Results of the study can be found in a Working Paper and a Briefing Paper. Loan Diep (loan.diep.10@ucl.ac.uk) is a consultant working with IIED's Human Settlements research group. She was previously project officer and researcher for WSUP Advisory.